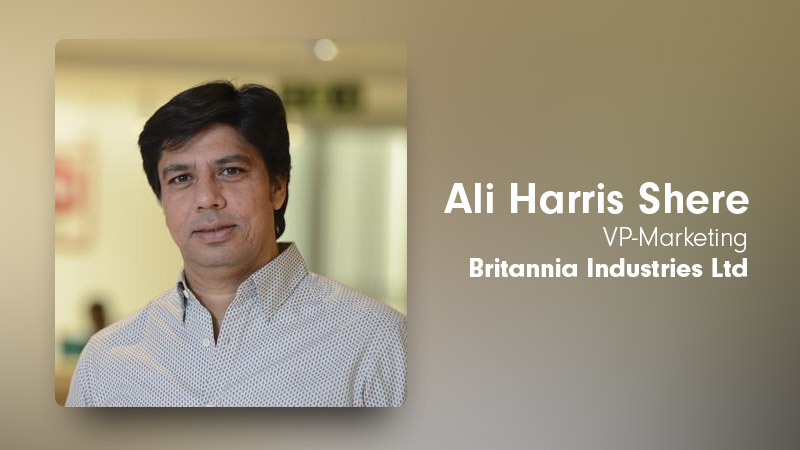 Ali Harris Shere, VP-Marketing, Britannia Industries shares some behind the scenes on Britannia’s revamped avatar, celebration of 100 years with an elaborate campaign. Britannia Industries celebrated 100 years of its existence and as part of the revelry revealed a new brand identity & philosophy, illustrating the company’s vision to become the ‘future of food’ – a global total foods company. In addition, the company announced that it will launch 50 new products in the next 12 months. Britannia also unveiled 10 TVCs conceptualized by Lowe Lintas, celebrating daily wins we all experience and the bonds we share with one another. The digital film is knitted with old-world charm, adding flavors of the past, present, and future while capturing a mélange of occasions across the century where a Britannia product has been integral to friendships, celebrations and togetherness. In conversation with Social Samosa Ali Harris Shere, VP-Marketing, Britannia Industries Ltd speaks at length about the campaign insight and objective from digital media, Britannia’s journey so far, key developments and much more. How has Britannia’s century-old journey been? Our 100 year journey has been delightful much like our products. In the last 100 years, India has changed, consumers have changed and perceptions about health and taste have changed. The part of this journey that has been so rewarding is that the relationship Britannia has with its consumers has only strengthened as we have remained a part of their lives – their everyday moments. Benchmark activities or key campaigns during such long journey? There have been many exciting moments over the last delightful 100 years. We were incorporated in 1918, launched bread in 1954, cake in 1963, dairy in 1997 and so on. We also began going global, acquiring business in the Middle East, in 2007. In terms of growth, in the 80s the Britannia business was equal to the current revenue of our Little Hearts brand. About a decade ago, in 2007, the company size was equal to the current size of Good Day. As far as key campaigns, there have been many from iconic jingles for Marie Gold to our world cup campaign and association with KBC. How has ‘Britannia’ as a brand evolved over the years? Britannia has continued to work towards evolving with our consumers – from our branding to the product innovations we have brought to the marketplace. It was in 1997 that we introduced a corporate identity of “Eat healthy, think better” which has worked well for us as Indian consumers have become more health conscious. More than twenty years later, we are evolving to appeal to the new, younger India, positioning Britannia to be more than healthy choices and rather a brand that offers both excitement and goodness. The key component of our brand’s growth and the strength in our consumer relationships have been a result of the growth of our power brands such as Good Day, Little Hearts, Marie Gold and 50 50. The true power of Britannia comes through as a symphony through all its brands which speak directly to each of their target audiences. How difficult or easy it is to sustain the engagement level of the consumers each passing year? How do you go about doing that? For Britannia, consumers centricity has been at the heart of everything we do. We have ensured that we look at the wide spectrum of consumers and find “MVP” of each product. For example, Treat has a strong TG of tweens while Marie Gold reaches homemakers. These strong POV brands keep our consumer relationships strong. Companies have a strong attachment with their logo as do their consumers – it represents you, tells the right story, conveys your personality and is immediately recognizable. However, as times change, so do design sensibilities and norms. Britannia is a 100-year old company that has seen the country grow and has grown along with it. The Britannia of today has a substantial change in outlook towards its business and therefore, we deemed the time to be right to undergo a design change. We tasked Interbrand, the world’s leading consultancy, with this not-so mean feat and it has taken two long and arduous years to arrive at the new logo and proposition. This refreshed logo sustains the brand’s legacy of ‘accessible premium’ while illustrating a promise of limitless opportunities, reaching the rapidly growing population of young, digital-savvy consumers. You’ll see that while we are holding on to red as our core color, we are introducing fresh colors which represent a new Britannia that is laser focused on delivering both excitement in taste and flavour and goodness in terms of health and well-being. It’s with this logo that Britannia will boldly move into this next decade, transforming from a biscuit company to a global total foods company. Rationale behind the 10 TVC campaigns and a digital one? Every piece of communication and engagement from our product brands hold unique messaging that resonate with each brand’s target customers. Good Day’s POV is that ‘the world will be a better place if people smile more’, NutriChoice – ‘it all starts with a good choice’, Marie Gold – ‘every homemaker is nothing less than a champion athlete’, Milk Bikis – ‘forget the future, get everyday right for your child’, 50-50 – ‘sweet is just half the story’, Bourbon – ‘real friendships are the most fulfilling as they as the only relationships without pretence and judgement’, Treat – ‘fun in the middle is the best escape from everyday pressures’ and Little Hearts – ‘heartbreaks can be fun, so go on – break some hearts’. Each of these brands reach a certain target audience and speak a language that is uniquely theirs. By using this approach, each brand plays an important role in keeping Britannia in the hearts and minds of our customers and builds the symphony of Britannia. It is exactly because of this very reason that we felt only one film would not do justice to our 100-year campaign. The campaign celebrates our 100-year milestone and while we developed a campaign platform of ‘sau saal jiyega’ — an age old saying with a heartfelt meaning — we knew it would reach more people and have greater meaning if communicated to consumers via a familiar face — their favourite products. For every time that the consumer thought of us (any consumer, in any context, for any need state and any brand), we turned up. And in turn they wished us a 100 years, for which we would like this campaign to recognize and thank them. How are you leveraging digital to take the legacy of the brand forward? We are a large brand, reaching 80% of Indian households. TV has always been a great tool that helps us reach the masses but in today’s world digital does become more and more important. Digital platforms, the medium of the future, give us the opportunity to communicate in an evolved, edgy and personal way. There are four things we try to do through digital: 1. Showcase our upgraded and premium portfolios 2. Reach the important youth sector that is more connected than ever before 3. Build thought leadership for our brands 4. Spotlight smaller Britannia brands that don’t have a place in TV. Consumers should keep an eye out over the next 12 months, as we will be launching more than 50 new products, entering new and exciting categories From a marketing standpoint, we will soon be launching consumer campaigns for power brands such as Marie Gold. Stay tuned!